Our inventory system has undergone a massive update and finally went live about two weeks ago. We have been building, and will be launching, a Bluetooth/wireless Data Bridge and accompanying iPad application so you can trace your roast profiles wirelessly, using your iPad. New iPad RoastLogger and wireless Data Bridge! I had this idea almost as soon as the iPad was released. However, integrating external hardware (speakers, hear rate monitors, thermocouple circuit board, etc.) used to be very hard due to restrictions from Apple. A couple of years ago (maybe less?) Apple lifted those restrictions and opened up their Bluetooth API. You don’t need to understand what that means, just know that it’s now possible for anyone to talk to any arbitrary Bluetooth device from their own iOS application. After the SCAA show last year, we decided to pull the trigger and start work on a Bluetooth Low Energy version of our 4-input Data Bridge. Our new wireless Data Bridge which measures up to four Type J or K thermocouples, humidity and barometric pressure. Shown is the first prototype which has a slightly different PCB layout than the production version. We took delivery of our first two prototype boards about six weeks ago. I’m very happy to report that we exceeded all of our goals. Testing has shown these devices to be within 0.3ºC of a handheld Fluke meter (which are really awesome, but not wireless 🙂 ) over a 24 hour period. On top of that, it’s great seeing the pressure and humidity readings alongside the temperatures (we’re quite curious to see how roasters digest and use these two new data points.) Manufacturing is proceeded as planned and we should have the first batch ready to go in time for the SCAA show. What’s awesome hardware without awesome software? 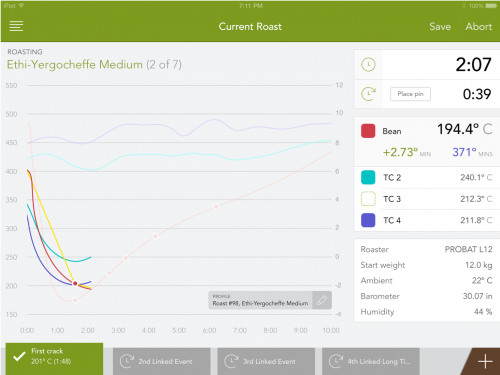 Similar to the Data Bridge, building a brand new app on iOS allowed us to critically look at our software and other roasting software on the market. Having over four years of real-world feedback was great help since we knew about things which worked and those which needed some work. Taking all of this data we hired a fantastic user experience designer and an equally awesome visual designer to come up with RoastLogger iPad. There are a few main screens, but the main one is this, the active roast screen. This page was designed to show as much information as possible without overwhelming the user. Fitting in all of the data to one screen without making it cluttered and clunky is not an easy task. We went through several iterations over a few months. I feel that landed on a very solid design and UX. One of the key elements on this screen is the events tab down at the bottom. Users can enter as many customized events as they like. For example, “gas up”, “air 50/50”, etc. All of your events will be displayed down at the bottom in a horizontal bar. Have a lot of events? No problem, simply scroll over to the right to find the one you’re looking for, tap it and you’re done. In the case that you’d like to add an arbitrary event, you can simply tap the + button on the right side. In addition to this, we support dropping a “pin” at arbitrary location to start a second timer, heating rate (rate of rise) is displayed on the chart in addition to the display, and roast energy is also shown in the right column display. There’s plenty of more stuff, which you can see first-hand at our booth at the SCAA show in a couple of weeks. We’re quite excited to show this off and think that this application will be the ones that other roasting software are compared to. Very impressive. Looks like a TON of hard work. Congratulations on it being up and running.